To commemorate the centenary of the end of the First World War there is an opportunity for every primary school in South Gloucestershire and other community groups to create local displays of Poppies in November 2018. Each school or group could produce, or join together to produce, a garden of poppies around their local war memorial or the local churchyard. 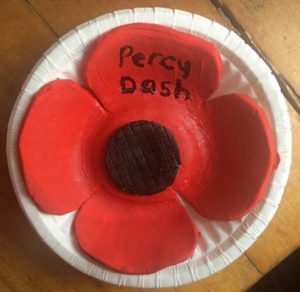 Each participating child or group member could make a painted clay poppy inscribed with a name they choose from those listed for the First World War, on the local war memorial. If you intend to display the poppies in a community setting, e.g. local war memorial or churchyard, we would advise speaking to your local church or parish council to seek permission to display the poppies. By using the South Gloucestershire memorials website, set up by the project, the children can find out about the lives of the local men that died in The Great War. Who were they? Where did they live? Use the Armistice Memorial Investigation Quiz to answer these questions. Full downloadable instructions are available here. If you have participated in this event, please complete the feedback form and return to: museums@southglos.gov.uk to comment on these learning resources, we would really like to hear from your school.